Ah, you do have a way with words. Lovely. Great write-up, as always. LOL at Thomas Oh’s speech, I was too so suprised that he didn’t take longer. 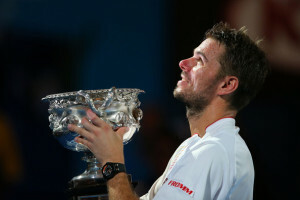 Now, I’m very curious about Stan´s season. Btw, I think ’Stanimal’ comes from Roger, at least I saw it first in one of his tweets. Interesting. I wonder if Federer really did come up with that? I have very high hopes for Stan’s season. I see a Masters final in his future, and expect he’ll accrue enough points to offset the loss of points at the US Open, where he won’t defend his semifinal. Now there’s some long-term predicting. Excellent article. I have been reading your blog for the last two years and your dry wit combined with your love for the game makes it a wonderful experience. Somehow, reading your articles makes me feel that that tennis will always have good to offer even as the generation I grew up watching retires. The lack of doom and gloom and GOATing is much welcome and your excellent sense of humour has made me laugh out loud on multiple occasions over the years. For allowing me to expand my vocabulary in such an enjoyable manner and for your insight, I wanted to leave this comment as a token of my appreciation. You have one very satisfied reader. Thank you. Thank you so much for commenting, and for reading all this time. It is greatly appreciated. And thank you for pointing out the lack of doom and gloom. I hadn’t really thought about it before, but I suppose an irreverent tone can be recession-proof, so to speak, since there are always new players to poke fun at. When it comes down to it, I like tennis too much to freight it down with earnestness. As always, an excellent piece, balanced and fun to read. There has been so much nonsense written about this match that I’d decided not to read any more about it, except for your blog. Watched the match twice, once in the middle of the night, with occasional dozing and then, when totally awake, in a replay. Your post was a great way to experience the match a third time. I have to admit I’ve largely given up reading most tennis writing, at least as a source of information or analysis. I still read some for comedy. My file on laughably bad tennis writing is now bulging. Matt Cronin has seen to that. Your comment on Wawrinka’s forehand is so spot on. It’s usually when that wing is working well that Stan can really bring up a good game. It’s ultimately the players who execute, but Magnus Norman, wow, quite the coach. We were courtside for the Wawrinka Berdych semifinal, and it was so apparent that night just how potent Stan’s forehand is (and in general hit noticeably harder than his backhand). For all those commentators who wonder aloud why he’d ever run around his backhand, the answer was quite plain. And Norman: I’m so happy about that, since I really liked him as a player (the Rome 2000 final was a masterpiece, especially since Kuerten was my favourite player at the time). I also loved what he did with Soderling – that was truly a miracle. Once again, Wow!! I could try to sit here desbribing your writing style, but it’s useless. All I can say is thanks for writing. Well, thank you very much. Much appreciated. If you liked this piece (which was one of the longer ones), hopefully you’ll enjoy some others from the last three years. Just discovered your site and writing – very refreshing and well-written stuff, a truly welcome respite from the unceasing tribalism of most tennis commentary/blogs. Will stop by regularly – thanks. Thanks very much. I hope you enjoy your visits. I hadn’t really thought of the benefit playing fewer games the first week might have had on Wawrinka. But really, he only had to play 5 1/2 matches for the championship. I’m not saying he didn’t deserve it….he absolutely deserves it. Luck is a huge part of sports….sometimes the “tennis gods” are just on someone’s side. Rafa’s has had his share of luck (though, not on Sunday) and most certainly so has Roger. I wonder…will this motivate the underdogs for the rest of the season? I don’t know that the underdogs ever lacked motivation. I do have a feeling Ferrer’s time at the top is coming to an end, which in the short term will leave his draw sections more open than usual, and will leave a lot of extra points floating around. Federer’s bad 2013 freed up a lot of points, too, and I suspect he’ll reclaim some of them. But that’ll still leave opportunity for Delpo, Berdych, Tsonga etc. My dream of a top eight finish for Haas is fading. I expect we’ll see a big reshuffle in the 10-20 bracket by the year’s end. Thank you for this, lovely writing, as always. The match has proven to be very revealing not only where the tennis is concerned, but also when it comes to tennis fans. I will only say that many have not been left speechless – quite on contrary. Nonsense and bitterness (launched at both players) have been having quite a party. Hopefully, they will exhaust themselves soon. Oh, and I love the gravity well theory. I can see scientists working hand to hand with mages (those responsible for pre-tournament predictions and jinxing/antijinxing rituals) to explain every facet of the game for us. They should have their own low-budget TV show by now. Tennis fandom right now is in such a strange and unique place, isn’t it? The long stability of the current era has ensured that fan opinion has had time to ossify, while the internet has developed such that finding a community of like-minds is not only easy, but much easier than encountering opposing views. Just about every online community becomes an echo chamber for hearing our own views repeated back at us. That’s not about to change, but I do wonder what’ll happen when (men’s) tennis goes back to being less predictable. Liked your articles very much. Extremely enjoyable to read. Thanks very much, and thanks for commenting. I’m kind of speechless savouring your words and wit! Thank you so much, once more. Now, don’t let the calendar fool you into believing the Davis Cup is the next gravity-well deserving to attract your attention… Not when there is an Annual 2013 eagerly awaited on at least 3 continents to bundle together, right?! Yes, that Annual. Hmmm. The truth is, there’s something like an Annual coming, but rather better. I wanted to remind you that Stan did make a Masters final last year–in Madrid, where he was beaten by someone named Nadal. Oops, I actually meant Masters title! I do remember Madrid very well. There was also a final at Rome in 2008, from memory. I’m really interested in Stan’s season as well – he will get some nice draws from now on and he can beat everyone except maybe Nadal, so a second slam (or a Masters for that matter) seems far from impossible. P.S. great piece as always. I’d love to see Stan pick up a Masters, and making a decent run at RG. I really hope he doesn’t fall in a heap after this, but somehow I doubt he will. It’s been such a smooth gradual build-up to this point. I also hope he doesn’t do something rash, like drop Magnus Norman. Inability or flat refusal to accepts changes or developments is only a part of the problem. For me the most striking thing is that very rarely are fans able to have a reasonable discussion when opposing opinions clash, because they tend to take things personally. Instead of holding a conversation that leads to modifying/changing/reaching some kind of conclusion, they end up being involved in a tug of war of egos to see who’s stronger in their convictions. Nothing is set in stone. If the sport itself is evolving, surely our understanding/perception or even allegiances should follow? I guess my musing was more wondering about why it is so different now than it used to be. Were fans previously better equipped to have a reasonable discussion, and if so, what has changed? One of the great things about this blog, along with Jesse’s terrific writing, is the comments section from thoughtful, respectful commentators. Wish more people contributed, but more seem to be finding their way here. It’s a pleasant oasis from other sites. I continue to follow the comments on one of them because occasionally there is interesting information or a link to a good article. But so many of the comments are simply attacks on certain players or even on other commentators. There is a real need for sites where there is informed discussion and respect even when people disagree. If only I wasn’t so tardy with my own comments. Sorry about that. Hopefully the something better will be worth the wait. I now have to be careful not to oversell it. Thanks for all the articles Jesse. I really enjoyed them as always, and you managed to evoke for me the spirit of my favourite (and hometown) sporting event far better than the ESPN coverage I’ve been watching. What do you make of Stan’s comment post-match that he couldn’t play his normal game cause he felt sorry for Nadal, as they are good friends? (I’m going by word of mouth here. Can’t find the footage.) Do you think that can account for it? 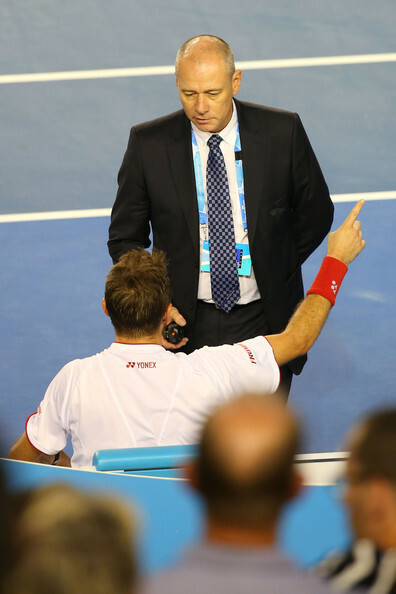 To me it’s plausible, but (to play devil’s advocate–and for the record, I like Stan) it seems more likely he suffered the same brain freeze and feet-fettering so many players suffer when playing an injured opponent (in short, an injured opponent encourages excess safety, which elicits physical tightness. In particular I recall an injured Simon drop-shotting his way to victory against an apparently lobotomized Ljubicic in Bercy). Is it possible to let sympathy get in the way of victory when your opponent starts breaking your serve with ease?! But like I said I can’t watch the interview, so I’m really just curious about the whole thing! What psychological explanation would you suggest for his sudden lull? I doubt whether it really was sympathy, personally, though I could of course be wrong. To me it looked like a classic case of playing like he had nothing to lose at the start, and playing like had everything to lose when it became clear that victory was pretty much laid out for him. So, much as I like Stan, too, it was just the usual brain freeze and feet-fettering, as you say. It was probably also made difficult by how different Nadal’s shots became. His serve became a powder puff, but his groundstrokes became not only aggressive, but quite unpredictable. Even allowing for the fact that this sport is far more tactically simple when you’re watching than when you’re playing, it was still a disturbing sight. I was a bit appalled, to be frank. If an elite athlete under pressure forgot basic physical skills, such as how to serve, he wouldn’t get a free pass for serving double faults for an hour. Yet Stan basically forgot how to construct rallies or return for quite a long time in that final, at a fundamental level. Granted it was an extreme situation, but still. I imagine he’ll handle it better next time, though. As you say, one expects he will handle the situation better in the future. What period of time are you thinking about here? I feel that expressing oneself (even only to vent frustrations or anger) has become more and more important than communicating – there are so many platforms we can use to make contact and yet curiosity runs out quickly. We should be better at having conversations, as you put it – we are taught how to do it in schools, at a workplace, we also have plenty more opportunities to practice it with people from very different cultural backgrounds. Somehow it’s not working that well. People have become skilled in presenting arguments, supporting them with facts, examples and what not but the point of any good discussion – understanding, discovery, creation of new ideas – is often missing. Often, not always, fortunately. I agree with you, of course. Jesse’s site is one of the two I’ve felt perfectly safe to (infrequently) comment on. This is just hoping you are OK and all is well with you and around you… While your uniquely talented tennis writing is being missed those days, it is your well-being, more than anything else, that is essential for the universal harmony! Never fear, Eva. I’m alive and well. And thank you. Universal harmony should remain untroubled. I plan to have some tennis stuff up quite soon.